Triads are one of the first harmonic tools to study. They are very useful for comping and chordal enrichment. 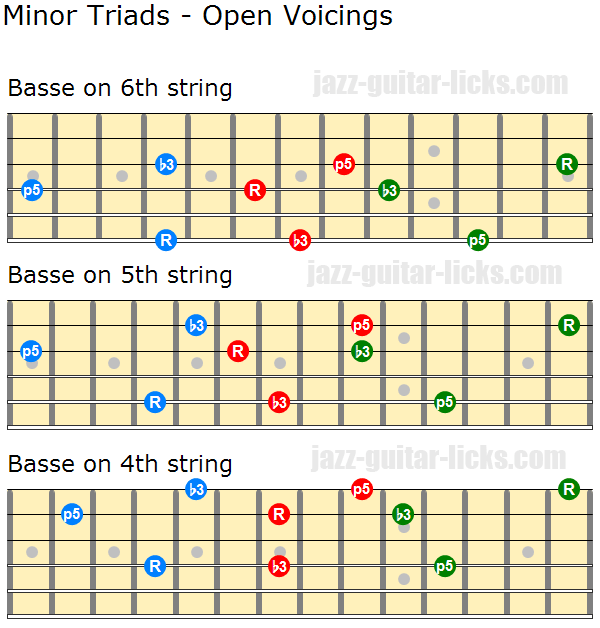 Learning close and open triad voicings increase your harmonic knowledge and at the same time help you discover your fretboard. In this lesson you will see the main triad chord shapes including root positions and inversions. You will also find some ideas on how to use triads over a II V I sequence, in order to create interesting melodic movement in your comping. Major triads are built by stacking three notes in thirds. You can also think of them as a one major third and one minor third stacked on each other. Interval pattern is R - 3 - 5. C major triad is represented below. 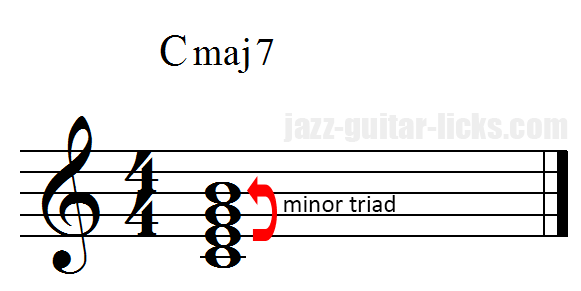 Minor triads are made up of two thirds, one major third and one minor third. Interval pattern is R - b3 - 5. You can see a D minor triad below. Augmented triads are built with two major thirds stacked. The interval pattern is 1 - 3 - #5. As its name implies it contains an augmented fifth. C augmented is shown below. One of the fundamental theoretical elements is to know how to harmonize the major scale in thirds in order to obtain seven triads built on each degree. By stacking thirds on each interval of a major scale, you get three major triads (degrees I, IV and V), three minor triads (degrees II, III and VI) and a diminished triad on the VII degree. You can notice that there is no augmented triad in the harmonization of the major scale. So, they will not be used in the exercises below. Please note that augmented triads can be found on the harmonized degree III of the harmonic minor scale, on the sixth degree of the harmonic major scale and on the third degree of the melodic minor scale. 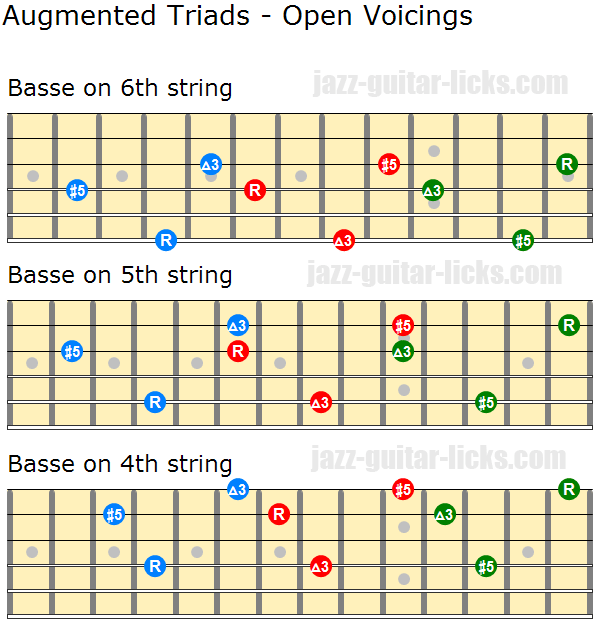 Before learning how to use triads over a II V I sequence, here are some triad guitar shapes that will serve as the basis for the exercises below (except augmented forms). All the triads below are closed voiced, meaning that all the notes are placed as close together as possible, they are all included in one octave. Each triad produces two inversions with third or fifth in the bass. Each neck diagram provides three possibilities to play a triad. What are open triads? It means that the notes are spread over more than one octave. Open triads are also called "spread triads". They can be very useful for composition or arrangement. They are also very helpful to explore the guitar neck more in-depth. Each triad generates three open shapes including a root voicing and two inverted voicings. Concerning the diagrams below, root voicings are represented in blue, 1st inversions are in red and 2nd inversions are in green. Please note that some of the shapes are a little bit stretchy, don't hesitate to experiment your own positions. 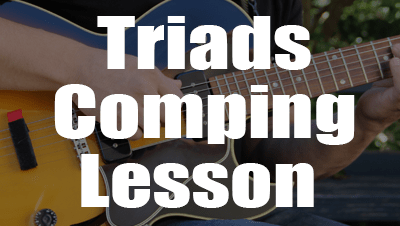 And now let's get to the essential point of this lesson : How to extract triads from seventh chords in order to use them over a common progression used in jazz, the II V I sequence. 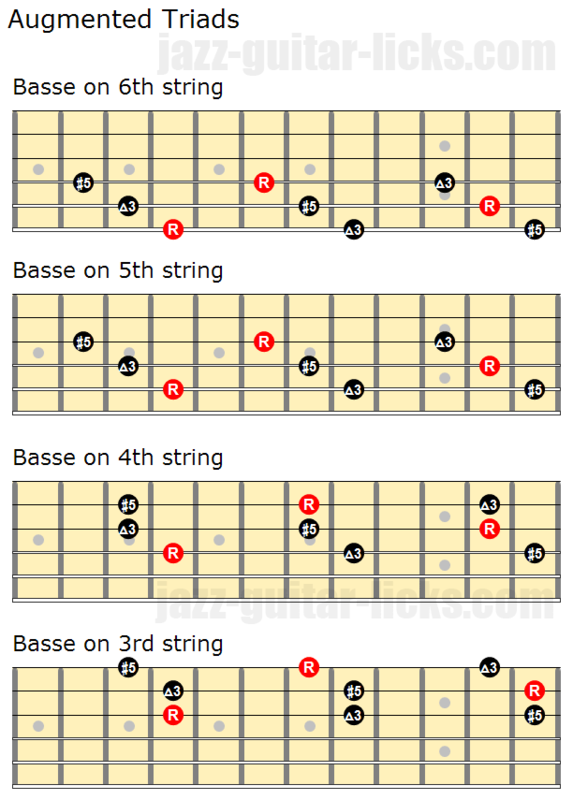 The first reflex would be to take the first three notes of each tetrad chords which, are obviously triads. Remember that tetrad chords are actually triads with an additional note that can be a minor seventh (b7) or a major seventh (7). But, playing these triads don't have much interest. In order to get more intersting colors, we'll take three tetrad chords better known as seventh chords (minor 7, major 7 and dominant 7) representing the degrees II, V and I of the sequence we need and extract the triads starting on the third of each 7th chord. This is what we call a "diatonic substitution". When we take the three highest notes of a minor seventh chord we obtain a major triad. 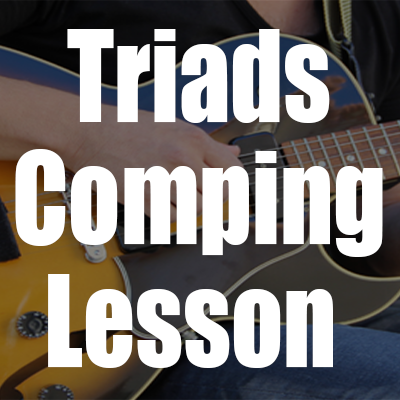 When taking the three highest notes of a dominant seventh chord we get a diminished triad. When taking the three highest notes of a major seventh chord we get a minor triad. Now it's time to apply this concept to a II V I sequence in Cmajor using some of the triad positions previously seen at the beginning of this lesson. The first five exercises implies triads in their close forms. 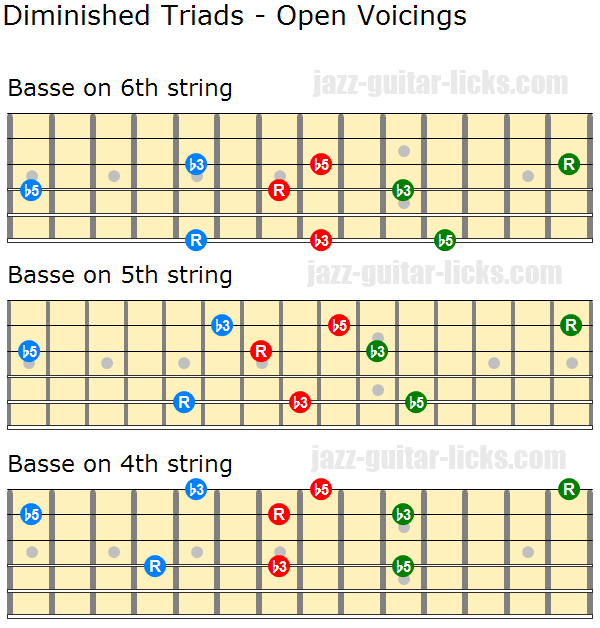 The five other triad workouts uses open voicings. This first II V I progression uses three triads in close positions involving three root voicings (not inverted). So, we get Fmaj over Dm7, Bdim over G7 and Emin over Cmaj7. In this example you see three triad voicings in their first inversion. 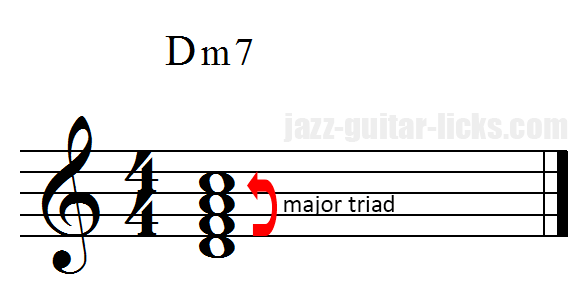 The first major triad over Dm7 can be renamed Fmaj7/A. The second triad can be written Bdim/D and the third triad over CMaj7 can be named Em/G. This example takes three inverted triads. One important things when comping with triads, is to avoid unnecessary hand displacement on the guitar neck. You see below that the positions are very close to each other. 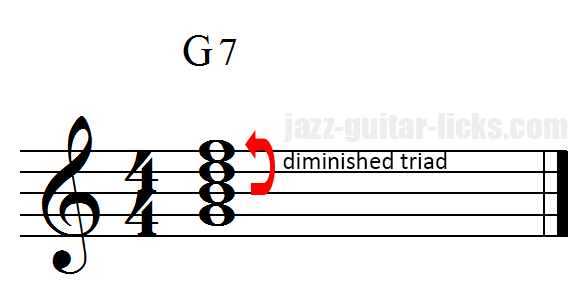 This example requires mixing two inverted voicings over Dm7 and Cmaj7 and a non-inverted one over G7. Once again the triad positions are close to each other. Two inversions and one root voicing are used in it. This exercise is to play open triads using two root voicings over G7 and Cmaj7 and an inverted one over Dm7. You see that Fmaj and Bdim share one note (F) as Bdim and Emin (B). This one requires the use of two inverted open triads. Three root voicings are used here. Triads, although they contain only three notes, must not be ignored because they can be very interesting when intelligently used. As you can imagine there are a lot of combinations. Don't hesitate to experiment your own positions and try to mix open and close voicings in order to comp over your favorite jazz progressions. What are Dominant Seventh Chords ? 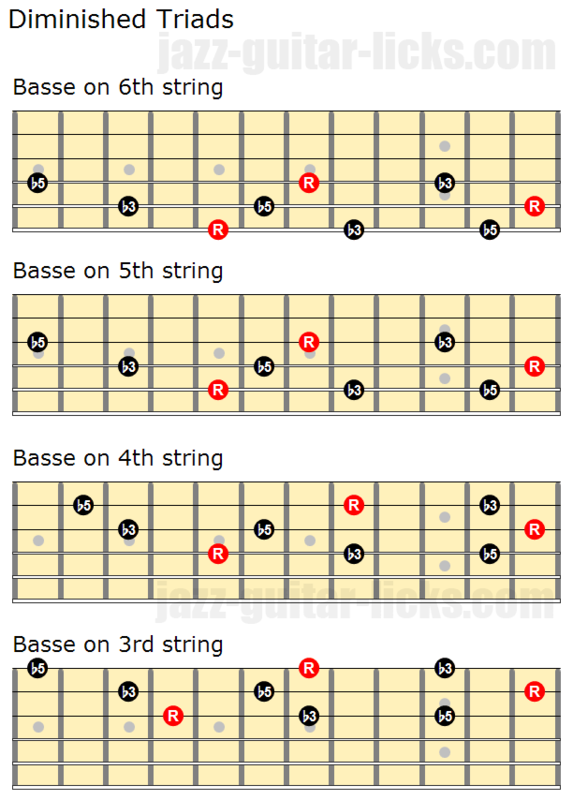 This lesson explains what is a dominant 7 chord. What is its harmonic function, how it is built and how to play it on guitar using the most important voicings as Drop 2, Drop 3 and Drop 2-4. This lesson with diagrams and charts explains what are drop 2-4 voicings, how they are built and how to play them on guitar using root positions and inversions. 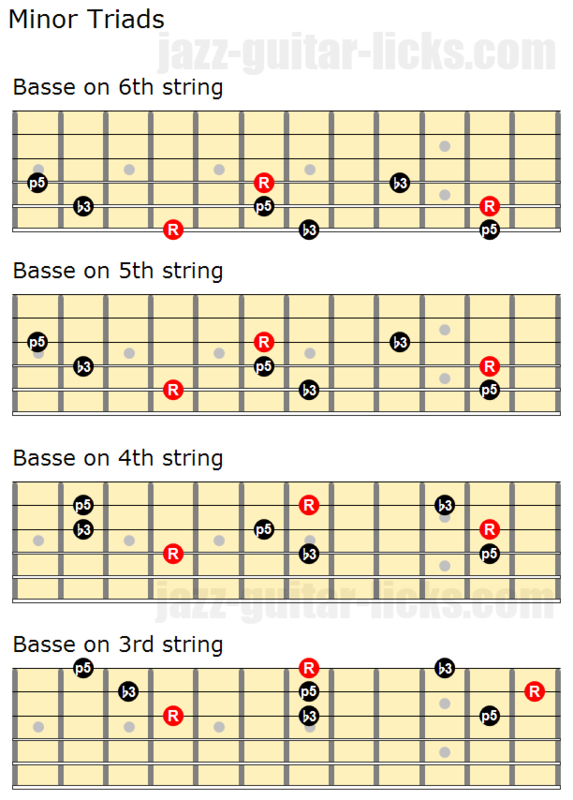 Altered dominant chords are widely used by composers and improviser in jazz and all styles of music. They can be useful to spice up a chord progression or harmonize a melody while adding a little bit of tension. This blog lesson provides some voicings with one or more alterations to play on guitar. 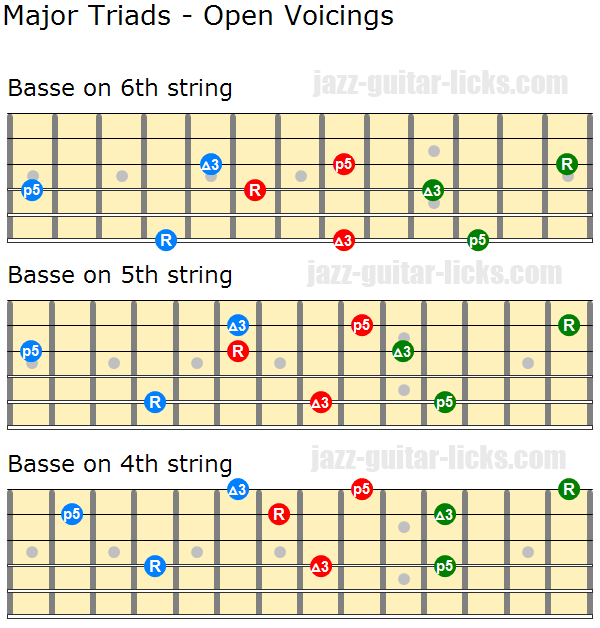 This jazz lesson show you how to play major triads on the guitar using close and open voicings. This printable PDF eBook method contains 50 exercises and voicings for jazz guitarists to master the main jazz guitar chords over a II-V-I chord sequence. How To Harmonize The Major Scale In Thirds? The goal of this music theory lesson is to explain how to harmonize the major scale in thirds with triads and tetrads aka four note chords. 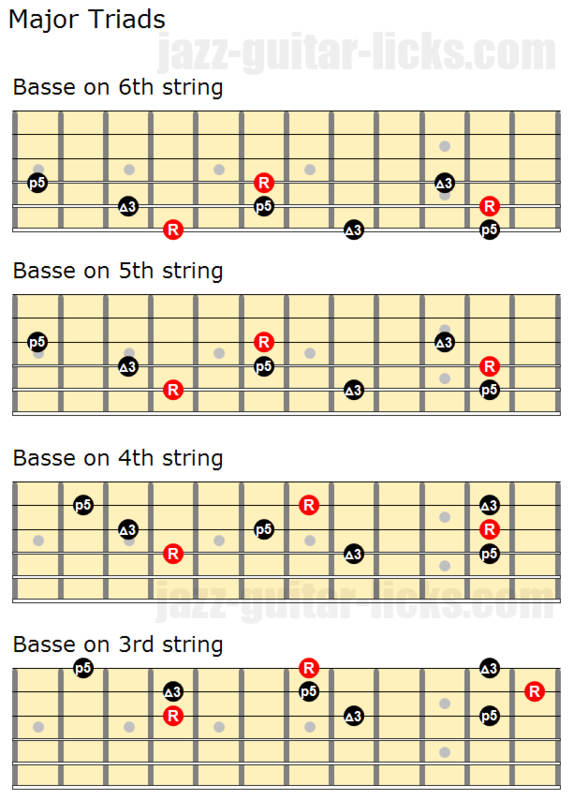 You will find here formula charts, standard notation with guitar tablatures and neck diagrams.